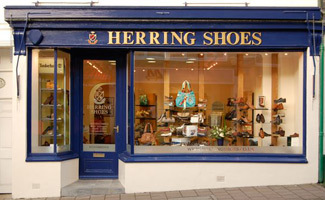 Herring Shoes is an English family business which was started in 1966 by Richard Herring. Our purpose is to supply top quality shoes from English manufacturers such as Barker, Church's, Cheaney and Loake with service to match through our website and retail shops. We retail our Herring brand of footwear which is tailored to today’s needs with fantastic styles and top quality, created from years of inside knowledge of the English handcrafted shoe trade. Our aim is to help everyone to understand how important good shoes are in life. Warehouse: Old Station Yard, Kingsbridge, Devon, TQ7 1ES, England. Our customer service staff are all shoe experts. Speak to them now on +44 (0)1548 854886. 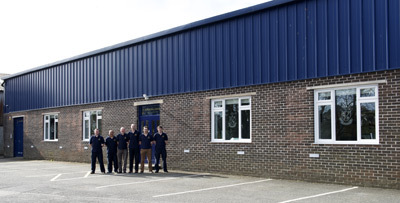 Over the years Herring Shoes have built close relationships with many of the Northampton manufacturers working directly with Mr Andrew Loake, William Barker and Jonathan and William Church. Adrian Herring the Product Director of Herring shoes worked in the Barker factory for a period to learn in detail the construction and craft of English handmade shoes. Through these contacts we launched our own range of footwear made for us by Northamptonshire factories including Barker, Cheaney, Loake, Trickers and Alfred Sargent. Alongside other specialist factories around the world we use the best manufacturer for each style of shoe we create and pass the benefit of our knowledge and experience on to the customer. The Herring range is made to the exact needs of our customers and by working direct with the factories we have the opportunity to create our own individual designs and styles which set us and our customers apart from the crowd. Our main drive is to offer outstanding quality and service by using our direct connections with the factories. Herring shoes trade from the retail site listed below in the UK and the web site runs from the warehouse listed above. Please note that the selection of shoes displayed on the web site are not always available in the shop so please call to check availability before making a journey for a specific shoe. Set in Kingsbridge, Devon this is more than a shoe shop, it is an English experience. Set on the main street the shop has a contemporary feel blended with original features. Men’s brands include Barkers, Church’s, Chatham, Ecco, Herring’s, Josef Seibel, Sioux, Sebago and Timberland. Ladies brands include Andrea Chenier, Chatham, Ecco, Gabor, H.B. Josef Seibel, Rohde, Timberland, and Van-Dal. Please don't call the shop with enquiries about our website. Our customer service staff are equally as expert - you can contact them at +44 (0)1548 854886.